Some of the more than 650 Canadian and American participants in the study were shown images of artwork that encouraged analytic thinking, while another group was shown images that were not intended to produce such thinking. 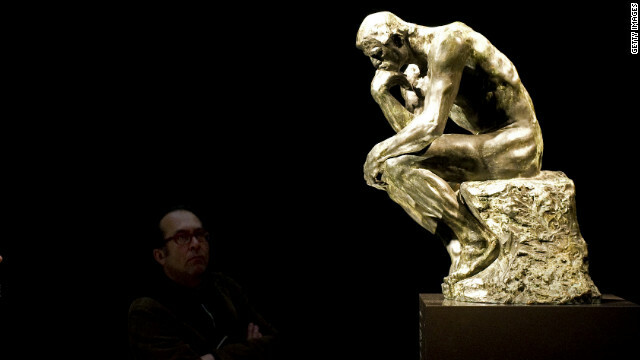 One of the images used to trigger analytic thinking was of Rodin’s statue “The Thinker.” A previous study showed that such images improved performance on tests that indicate analytic thinking. In addition to the artwork images, the religion study used other stimuli to promote analytical thinking. After exposure to such stimuli, researchers gauged participants’ religious beliefs through a series of questions. Subjects who had performed analytical tasks were more likely to experience a decrease in religious belief than those who were not involved in such tasks. That included devout believers. “There’s much more instability to religious belief than we recognize,” said Norenzayan, noting that life’s circumstances and experiences, from traumatic events to joyous occasions, can lead people to become more or less religious. Norenzayan is quick to mention that the experiments did not turn devout believers into total atheists. But he speculated that if people habitually think analytically, like scientists or lawyers do, it would lead to less religious belief in the long run. Robert McCauley, director of the Center for Mind, Brain and Culture at Emory University, and author of "Why religion is natural and science is not," found the study particularly interesting because he thought it was difficult to make even a minimal change in religious belief. “It’s not likely you would argue someone out of a religious belief very often because they don’t hold those beliefs on argumentative or reflective grounds in the first place,” said McCauley, who believes religious beliefs rely primarily on intuitive thinking. Analytical thinking alone does not necessarily lead to a decrease in religious belief, emphasized Norenzayan. “There’s a combination of factors [as to] why people become believers or nonbelievers - this is only one piece of the puzzle,” Norenzayan said, explaining that his team doesn’t think analytical thinking is superior to intuitive thinking. Next entry »My Faith: What does God sound like?